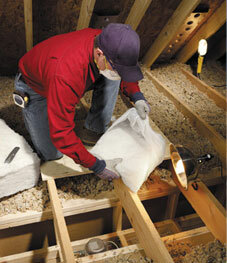 There are many different types of attic insulation to choose from if you need an energy efficient replacement. Choosing the right one for your project can be difficult, so why not let the experts at Arango Insulation help. Our staff has worked with all forms of residential insulation for over a decade, from environmentally friendly cellulose attic insulation to traditional batts and rolls along with everything in between. We can use this experience to advise you on the benefits of each product, and help find the right solution to fit your home and budget. Whether you choose state-of-the-art foam for your attic in Marietta or cost-effective blown fiberglass attic insulation for your home in Lawrenceville, you can count on Arango Insulation to provide you with quality products guaranteed to insulate your attic and increase your home’s energy efficiency. Our years of experience with all the various types of attic insulation these brands offer allow us to install them rapidly and correctly. In many cases we can remove your old insulation and install your new attic insulation in less than a day. This means you can immediately start enjoying a more energy efficient home without interrupting your daily routine. For more information on the many types of attic insulation that Arango Insulation can provide for homes in Atlanta, Suwannee, Marietta, Alpharetta and other Atlanta area communities, contact us today.